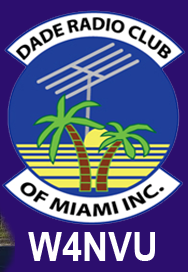 October – W4NVU – Dade Radio Club of Miami Inc.
Meeting was called to order at 19:31 with 25 present. We have a quorum. Julio presided over the meeting and welcomed everyone. The meeting was not broadcast live on the air tonight from the EOC. There was testing being conducted in another room tonight. Everyone took turns and stated their name and call sign. Julio welcomed everyone again. There were no minutes posted on the website. Corresponding Secretary: Lloyd announced that there will be a Silver Springs Hamfest on December 3, 2016. Treasurer – Brianna is not present tonight. Dues for 2017 are due. If you have paid your dues and need an ID, see Julio. Website – Ryan is not here yet. There is an issue with internet explorer and Ryan is working on getting it corrected. Club Elmer/PIO – Miguel is not present tonight. Lloyd announced that there were no events that he was aware of. Paddle Fest – Julio stated that it took place on October 1. They did not do the course because it had to be closed because of bad surf. The actual event did not take place. Wounded Warrior Ride – David is not here tonight. Julio announced that the ride takes place at the Homestead Speedway. There are divisions for 35, 60 and 100 riders. We need volunteers. Contact David at KE4TIN@gmail.com. It will take place on October 30 between 7 AM and 2 PM. Hurricane Matthew – We got very lucky. RACES was activated for the hurricane. Julio, Brandon and Hollis participated at the EOC. We had 97 check-in and 35 of them were unique check-ins. Several Hams were at the Hurricane Center and Armando was working the Red Cross radios. Thank you to everyone that participated. Melbourne Hamfest – because of the hurricane, it was moved to October 21 and 22. The 147.000 – Carl is getting a quote for work to be done on the Channel 6 tower. We will be having a fund raiser to get the funds necessary. Our back-up is the site in Aventura. We will take equipment donations and raffle them off to get the funds needed. The 147.760 – Ray is not here tonight. It will be moved to the old weather center on US1. The 444.200 – Is up and running. It ID’s 15 minutes early. D-Star – Is working. Eddie was staffing at Jackson Memorial Hospital Emergency Center on it for the hurricane. Hamboree – Lloyd spoke about the board meeting that was held. It is up and rolling. The facility has its own staff and will do a lot of the work for us. We still need a lot of volunteers. Lloyd contacted Carol from Broward County so that we can work together at this event. Lloyd contacted patrons and visitors to past hamfests. This year it will be bigger and better. Kenwood expected to be there at the War Memorial and David from MTC has almost given us a guaranteed yes. He will update the website and South Florida Hams. The website is Hamboree.org. Contact Lloyd if you can volunteer. QST will be advertising the hamfest in their January issue. The War Memorial is advertising for us on Facebook and with every show that they do. An LED slide will be up. We ordered and have received 6,000 mailers which only cost us $179.00. Julio played a video of two young girls with their go-kit for Hurricane Matthew on Hamradio.world. They used an Alpha Loop Antenna. Great video and the members discussed it afterwards. Eduardo announced that he has an ICON IC 775 DSP for sale if anyone is interested. Julio spoke to Miguel on the phone. He thanked everyone that participated in the emergency net. Bradon the Net Manager spoke. He also pointed out corrections that need to be make on the website. He spoke about the Jr Orange Bowl Parade on November 27th. We held two emergency nets for Hurricane Matthew. Even though it did not hit us directly, it was a great storm prep on Wednesday and Thursday. Great practice. We will resume the normal net schedule. Testing – Dave announced that we have 5 new Techs tonight and one was from another country. Congratulations to all!!! New Business: Hollis asked when was the next DRC meeting and it was announced that it would be November 14. Julio thanked everyone for coming. Hollis made a motion to adjourn, seconded by Bob Willaimson. The DRC meeting was adjourned at 20:27.